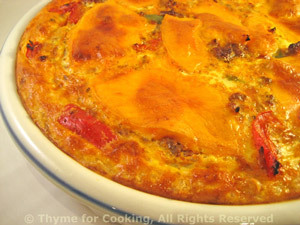 Beef and Cheddar Quiche, Thyme for Cooking easy gourmet tart. Brown rice makes a healthy, flavorful crust for quiches and savory pies. Cook it ahead of time for quicker prep time. Use less cheese if you like - I was thinking 'cheeseburger' when I made this. Add 1/4 cup shredded cheese and the cooked rice. Heat oil in large skillet and add paprika, onion, garlic and peppers. Sauté until tender, about 7 minutes. Add beef and brown, breaking it up. Add oregano and tomato paste, stir well. 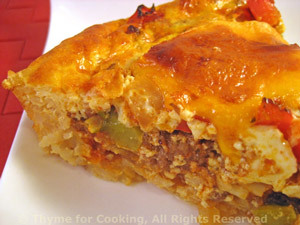 Spread the beef and peppers over the baked crust.